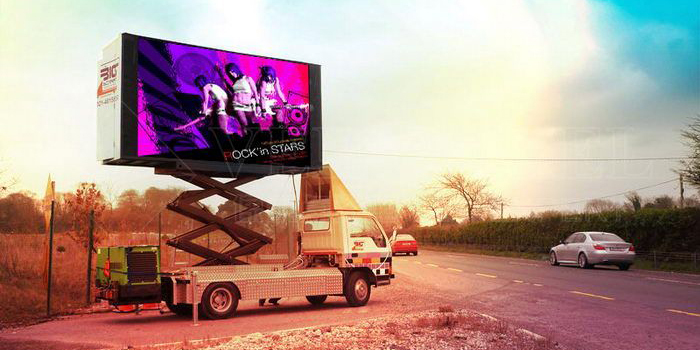 LED Mobile Truck Display | LED Truck advertising | LED full color mobile display - Shenzhen Verypixel Optoelectronics Co., Ltd. In recent years the LED display industry has developed rapidly,and the LED car display also emerge at the right moment, the so-called LED car display is the LED display that installed on mobile vehicles used to display various kinds of information such as text, graphics, images, animation, market information, video, video signal, etc. Relative to the TV advertising on buses, there are advantages by using on-board LED display to achieve the mobile advertising playing that high brightness, large area, waterproof, sunproof and far away influence. Mobile LED Traffic Guidance Solution: Very Pixel Follow Me Sign is a mobile LED display used as a visual guide for aircraft at airports. Preprogrammed messages—including follow me, stop, wait, left and right arrow indicators, and slow down—are used to direct aircraft to the right location on the ramp/apron. The solution of display is operates from the vehicle’s standard 12 Volt battery and can be easily installed and operated from the driver’s cab, and we recommend a separate fused circuit. LED Taxi Sign Solution: Even nowadays in many cities, the taxi cab company still use the old fashion signs showing only the letters "TAXI", or a light box to show some static advertising pictures. It is such a huge waste because the taxi cabs are such good public advertising media in the modern cities! How it would be if there's some kind of taxi cab roof top signs showing the attractive video advertising information? LED Train Display Solution: Verypixel LED destination sign has an unparalleled visual impact. Through high definition characters, 120° horizontal visibility, and automatic brightness control, the LED displays are easily visible day and night and in many weather conditions. They are built to be both lightweight and inexpensive to maintain due to the elimination of moving parts and the long life of LED. The destination sign can be installed on the front, side or rear of the train. Both amber and color displays are available. LED Bus Display Solution: Verypixel LED BUS sign has an unparalleled visual impact. Through high definition characters, 120° horizontal visibility, and automatic brightness control, the electronic signs are easily visible day and night and in many weather conditions. They are built to be both lightweight and inexpensive to maintain due to the elimination of moving parts and the long life of LED. Our LED BUS Display features high performance surface mount technology (SMT) LEDs and a lightweight aluminum case. information display can be selected through the embedded keypad of the control unit and uploaded with a USB stick.